Welcome to the 201st gathering of best space news on the web; something we call the Carnival of Space. If you’re new, please take a look at past Carnivals. If you like what you see and want to participate by contributing or hosting, let us know. June has been a spectacular month for astronomy and space. Most of the world, except for North America, will witness the best total lunar eclipse since 2007. Vega 0.0 guides beginners (in Spanish) in viewing this astronomical event on the 15th. Unless you’re in Australia, in which case the eclipse occurs on the 16th. Astroblogger Ian Musgrave also gives timings and observing tips. While Urban Astronomer is gazing at the Moon this month, he may be using lunar occultation to turn the Moon into a telescope. You can too. Astroswanny live blogs a transit on KOI 256b. Did you know there were as many as 8 of the Kepler objects of interest transiting every hour!!! I cannot think of a better time to observe a new supernova that exploded in the Whirlpool Galaxy, M51. This opportunity is not lost on Astroblogger. This is not only a great opportunity for astroimaging, but also a good opportunity to use crowdsourcing to study the evolution of the supernova. Check out our active Sun. On June 6, a powerful solar explosion kicked up a surprising amount of material, creating a huge veil of dark plasma that spectacularly rained back down on the solar surface. It’s been a busy wildfire season already and this is even evident from space. TheSpacewriter muses about the vast number of fires burning on Earth’s surface. Private sector space travel has been heating up this year. Cheap Astronomy reviews some current developments in private sector space travel. In NextBigFuture, Brian Wang explains that by 2016 Bigelow expects to have a fully functioning station in orbit and to begin charging rent for it. Prices start at $28,750,000 per astronaut for a 30-day tour. That’s a lot of money, he admits, but says economies of scale will drive the price down quickly. He also points out it’s still less than the estimated $35 million Cirque du Soleil founder Guy LalibertÃ© paid in 2009 for 12 days aboard the International Space Station. Article 16 of the Outer Space Treaty of 1967 allows any signatory to withdraw with 12 months notice. If countries like India or China were to withdraw in the 2020s when Bigelow speculates about a lunar land rush. Brian also presents a discussion of recent and planned experiments of Mach Effect propulsion. 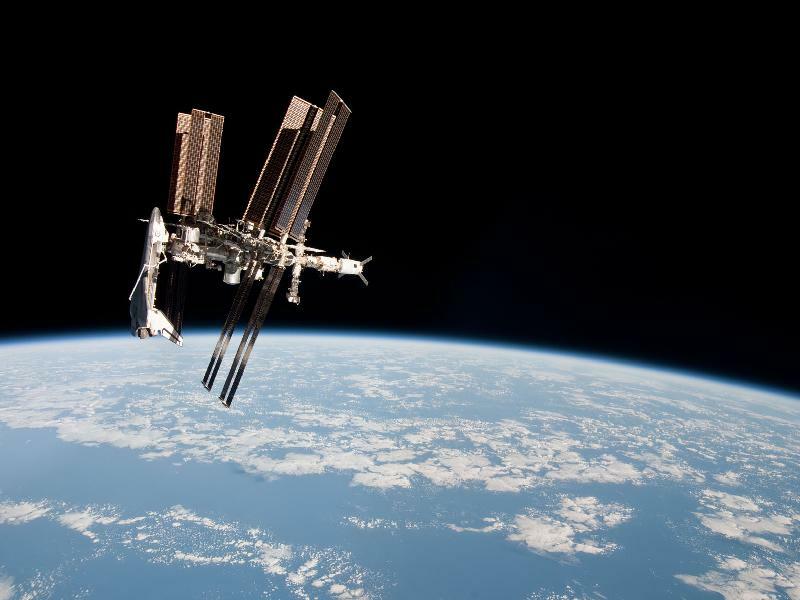 It seems strange that more than 30 years since the first shuttle launch, we didn’t have a picture of a space shuttle docked at the International Space Station. We do now. Newly released and unique pictures from astronaut Paolo Nespoli from the Soyuz TMA-20 are spectacular; even more so when you zoom into this slideshow of the ISS and Endeavour from StarryCritters. Centauri Dreams wonders if an organization can be created with the longevity to design a vehicle when the timeframes involved might be a century or more. Marc Millis offers a response to the Request for Information from DARPA/Ames’ 100 Year Starship study. WeirdWarp explores five new projects announced by the NASA astrobiology science and technology for exploring planets program (ASTEP). ASTEP promotes the search for life on other planets and supports research and exploration of the Earths most remote places. Vintage Space takes a look at the Rogallo wing’s life after the Gemini program – its proposed inclusion into Apollo and the US Air Force’s planned use of the paraglider to land its Manned Orbiting Laboratory. Unlike previous voyages of exploration, humanitys first steps on the Moon did not inspire great works of art and literature. In fact Project Apollo has rarely even intruded in to popular culture. However in the past forty years there has been a smattering of movies and TV shows featuring Project Apollo. Armagh Planetarium takes a look at some of the most interesting.